Born 1974 in Kuopio, Finland. Lives and works in Gothenburg. 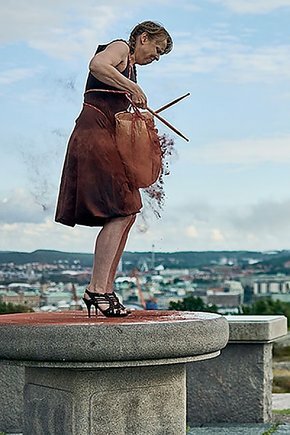 Kaisa Luukkonen works with performance and installation art. She got her BA from the Polytechnical School of Satakunta Kankaapää Unit in 2005. Kaisa Luukkonen’s performance practice started in 2007, and it has developed into a work that uses materiality and the body-mind entity to comment on our social condition. She sees the potential in performance as a form of resistance to the commercialisation of our existence and a way to find other ways of co-habiting space. She was the Co-Producer of MediaPyhät-media art happenings between 2009-2012, and worked with the performance club Perfo! in Tampere until 2016. Currently, Luukkonen is on her last year of Masters of Fine Art at Gothenburg University. Kaisa Luukkonen. Drummer Girl. 2017.